“Gahesha asks you to consider what exactly it is that you want at this time. He asserts that your desires are within your reach. The Universe is conspiring to help you achieve your aspirations. Since the Universe is in harmony with your desires, the “how” will transpire effortlessly. Ganesha is bestowing on your blessings of luck, love and new prospects. Be very clear about your intentions at this time. Once you have identified what you desire, Ganesha will work to clear the obstacles and amp up your blessings. Withstand the temptation to succumb to self-indulgence. You are in an excellent affluence phase. This period will not last forever, so be sure to take advantage of it, and act when opportunities arise. Resolve will triumph. The principle of averages works in your favor now. The more that you perpetuate something that you want, the more likely you are to receive that very thing, even if it feels impossible. These manifestation possibilities are endless and range in subject matter; from love, to money, to success, to happiness. Oh wow, the synchronicity… how I love it when the messages all flow together so beautifully. Thank you to the angels, guides and ascended masters working with me to bring these words to you every day. I am so very grateful. Blessings of luck, love and new prospects. Thank you Lord Ganesha; The Breaker Of Obstacles. Again we are reminded to use this blessing wisely. What do you wish to create? 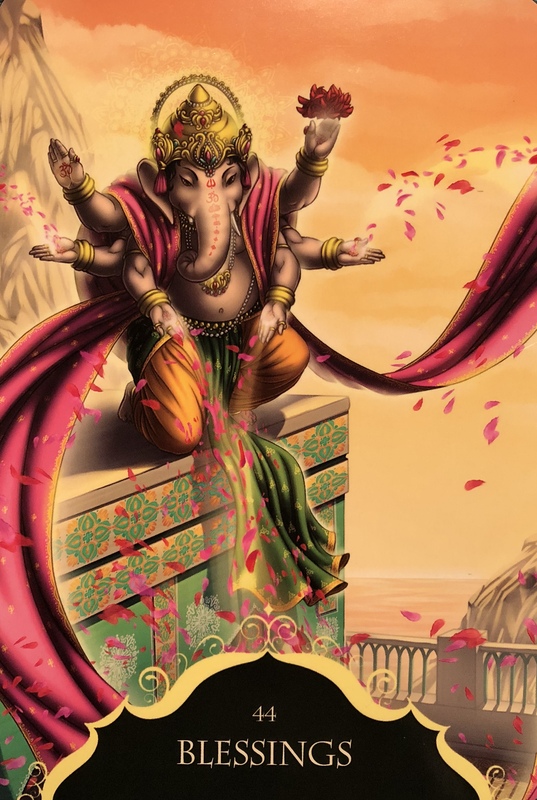 As Ganesha is telling us here, this is a particularly powerful time, the energies are strong, and truly anything is possible. If you allow it. Break through self imposed limiting belief systems. Release worries, doubts and fears. Know that you are in a phase of great blessing, and act accordingly! Instead of resistance, practice gratitude. Be thankful for every opportunity that comes your way. See the blessings as they are presented to you. Open each one like a priceless gift. Honour yourself and your process, knowing that everything you have been through, all the hard work you have put in, has gotten you right here, where you needed to be. See this as a turning point. A door opening into everything that you have been trying so hard to manifest. For you here there is love, prosperity and abundance. There is joy and peace and health and vitality. There is possibility and there is hope. There is a brand new perspective on life, which is one of the biggest gifts there is. Embrace these blessings and move forward fearlessly. What you desire is just around the corner.